This hat has the look of cables without using a cable hook. I have previously published this pattern as in-the-round, but have published this straight needle version by request. Repeat between * across the row. Cut the yarn with several inches to work with. With a yarn needle, pull the yarn through all the remaining loops, secure, seam the side of the hat and weave in end. The Fuzzy Square is pleased to let you know that one of your hat pattern is featured on the Fuzzy Square blog. I am knitting the men’s medium and before I continue I am questioning rounds 37 and 38. In the previous rounds we did rows 17 and 18 and 15 and 16, so you don’t do 13 and 14 again? Thanks for your assistance I just don’t want to rip it out! Love this pattern! 13 and 14 are like 17 and 18 but with the ribbing. 15 and 16 are the widest point of the aran pattern, so the pattern is correct to then go back to 17 and 18. Thank you for being willing to share your hat patterns. I am knitting watch caps for seamen’s mission at a local port. I am excited about including your patterns in my next collection to this charity. May God Bless you. Thanks for making your patterns available..much appreciated. US. I also give the mm on needle sizes since those are universal. I found a pattern for a man’s Mock Aran Kniited Mens hat, how would I adjust the sts to make it for a woman? What circumference do you need? About 22 inches. (I had the same question). Love the pattern. If the head circumference is 22″, the medium size hat (with 20″ circumference) would be perfect. I would really like to make the Mock Aran men’s hat for my son. He’s a special person that doesn’t usually ask for much when it comes to fashions, but he really like this hat. He has a 24 inch cir- head. Could you share with me how I could increase the pattern to fit this size? We both would be very grateful!! The finished hat is very stretchy. The large version should be perfect. Is there a way to make this hat taller? I would love this pattern on a slouchy beanie and I also have a lot of hair that I would need to fit into the hat. Is there a section of the pattern that I could just continue for a few more rows to give my head a bit more room? Thanks in advance and I love the pattern!!! The easiest place to add rows is in the ribbing at the beginning. You can add four rows at the point where the diamonds are the widest, or any number of rows at the point where the diamonds are the skinniest, but that will change the look of the diamond pattern. I would like to make this hat for my husband. I have some dk weight yarn and 4.0mm needles. Should I cast another 12 stitches? .. im having trouble understanding row 3.. do I k1 p1 4 times? ??.. sorry I a little confused. ..
To keep with the repeat of the pattern, add 16 stitches (for a cast on of 113) for the medium size or 18 (for a cast on of (127) for the large size. Yes. When I say do some number of times, it is referring to the instructions in the preceding parentheses. 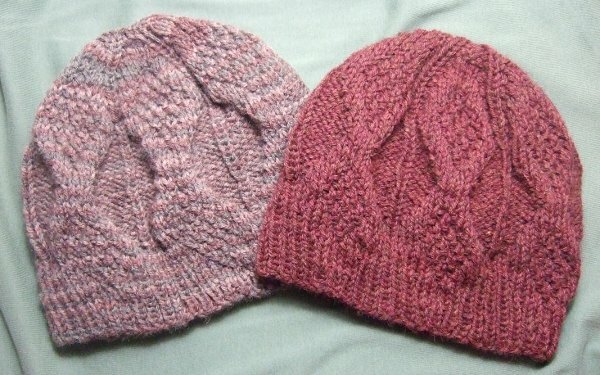 Where can I find your knitting instructions for knitting in the rd pattern, I also would like a smaller size than mens med so could I use 20 st. to 4″ gauge on 5mm needle I can get that gauge with the yarn I’m using to work out a smaller size of 19.2 in.hat. Your size adjustments sound perfect. Thanks very much for your quick response love your patterns. Hi! I would like to make this hat with a super chunky yarn (8mm needles). for the large size, I should reduce the amount of the stiches by 18?? thank you! Hey, beautiful pattern! I’m stuck on row 5 & 7. I know it must be something simple that’s not clicking in my brain, but I realize I have stitches leftover when I do the row, so how does those two rows work? Thank you for posting the pattern. Are you doing the medium or large version? Hi love the pattern on this hat.Is there a pattern to make a matching scarf? Many thanks in advance. The hat is a 16 stitch repeat (the medium version). To make a scarf, two repeats would be about 7″ and three about 10″. For two repeats cast on 37, or for three cast on 53. Cast off with the last row. Finish and weave in end. Could you translate this pattern into one for a toddler? I’m sorry it took so long for me to get back with you on this. If you use DK weight yarn and size 6 (4mm) needles, the pattern for the medium size will make the perfect size for a toddler. I would like to make this beanie for my child but the circumference is 15in how would I make it smaller and also I’m working with size 9 (5.5mm) needles thanks for the help. You can cast on 73 and work the large size pattern. This will make four repeats of the pattern around the hat instead of six and will come out to be the circumference you need. The problem is going to be the height. It can either be made the full height and flipped up at the bottom when worn, or you will need to work the crown differently. I’m a little confused about rows 29 to 40. I understand that the pattern basically goes backwards, but in that case wouldn’t the pattern be “Rows 29 and 30: Repeat rows 26, then 25″? The odd rows are the front and the even rows are the back, so odd rows have to be repeats of odd rows and even rows have to be repeats of even rows. Yeah…I figured that out soon after posting my comment. Thanks for clearing it up for me. I love this pattern. The medium pattern is a multiple of 16 plus an extra stitch. The large pattern is a multiple of 18 plus an extra stitch. Neither will work out to 133. If you don’t mind a little ribbing between the diamonds, you could modify the large version by adding “k1, p1, k1, p1″ to the beginning of each repeat of each odd row and “p1, k1, p1, k1″ to the beginning of each repeat of each even row. Thx.Mama dear for the reply and helping me out.i will now try with this k1,p1 extra st pattern. Hi Heather, I just wanted to say thank you for all the lovely patterns. You are an inspiration and I do browse these pages when wondering what to work on for my next project. Many thanks. Hi, what a fabulous pattern thanks for sharing..
Hi, I’ve done both the large and the medium version for two different people and its come out fabulous. Am making the scarf you’ve suggested now have seriously fallen in love with this pattern. Have you done any adaptation of it for a sweater? I have a five year old and an 11 year old, I’d love to make sweaters for both of them with this pattern.. This required so much math and visualisation to design, I’m totally in awe of you. thank you so much for putting this pattern up. I haven’t posted any sweater patterns. They are more of a sizing challenge than what I’ve tackled so far. Can I knit this hat using circular needles? Yes! I call it for straight needles to distinguish it from my in-the-round version of the hat. In row 5, do I knit all the way to the end of the row, k1 included and THEN do the instructions between the asterisks, and end the row that way or don’t do the k1 until the very end of the row? Repeat the directions between the * across to the end of the row and you will have one last stitch left to make the k1.